Traversing the heart of New Zealand's wild fiord country, the Milford Track has long been described as "the finest walk in the world". Since Quintin Mackinnon pioneered the route in 1888, everyone from hardened trekkers to novices sporting their first pair of boots have taken up the challenge of the Milford Track. 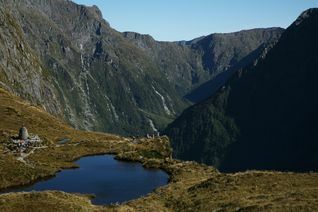 The Fiordland National Park is the cornerstone of the Te Wahipounamu Southwest New Zealand World Heritage Area. 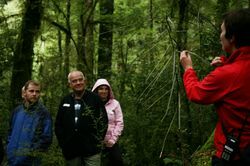 Walkers on the track to Milford Sound enjoy close encounters with the native birdlife: the robin; kea; weka; fantail; parakeet; bellbird; even kiwi have been spotted! They also experience Fiordland hiking at its most spectacular: deep lakes; silent fiords; luxuriant forest and sheer canyons carved out of imposing granite define this landscape. On fine days there is a postcard shot around every corner but only when it rains and torrents of water cascade down the mountainsides, have you truly experienced the magic of the Milford Track. 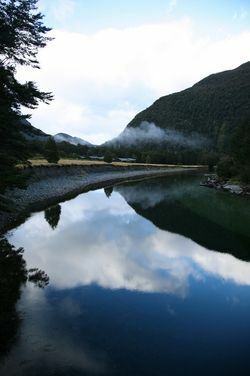 The Milford Track Guided Walk is a 5 day / 4 night Queenstown to Queenstown all-inclusive guided walk through the heart of Fiordland National Park to Milford Sound. This all-inclusive package includes transport, accommodation, meals, snacks, backpacks, rain jackets and a cruise on the walk's grand finale: the majestic Milford Sound. Accommodation is in well appointed wilderness lodges, and you will be led by expert guides. On the afternoon before your departure you are required to attend a pre-track briefing. Please check in at Queenstown at 4:45pm. Here you will receive a complete outline of what to expect, be provided with equipment, given an opportunity to purchase last minute required items, complete the required medical forms, ask answer any last minute questions that you may have, and meet your fellow walkers. The adventure begins at Queenstown where you will board a coach to Te Anau, arriving in time for lunch and a group photo. From Te Anau Downs harbour, a launch will take you up to the head of Lake Te Anau. From the wharf it's a short walk to the historic Glade House for afternoon tea. Afterwards, your guides will take you on a short nature walk to explore the area. After a hot shower and three-course meal it's time to get some rest in the snug beds, either in the multi-share bunk rooms, or private ensuite rooms. This is the most demanding day, especially in inclement weather. The track leads to Lake Mintaro at the head of the Clinton Valley, before climbing the Mackinnon Pass in a series of zig-zags. Take your time and enjoy the views. 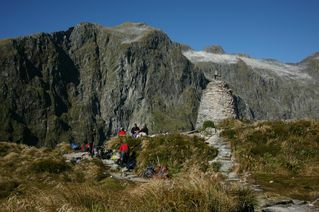 At the top you will be rewarded with spectacular panorama and lunch in Pass Hut. After the rocky decent into the Arthur Valley you will welcome a hot cup of tea at Quintin Lodge. This should be enough to refresh you for the optional 90 minute round trip to the Sutherland Falls, the world's fifth highest waterfall. From here it is a short launch trip to the renowned Mitre Peak Lodge, the only accommodation at Milford Sound, offering superb views of Mitre Peak, often referred to as the eighth wonder of the world. Here you will enjoy a celebratory dinner while relaxing with the knowledge that the hard part is now behind you, while the magnificence of Milford Sound is right in front of you. Mitre Peak Lodge - Milford Sound - Te Anau - Queenstown. No walking. Wake to the tranquillity of Fiordland, and after breakfast experience a magical cruise on Milford Sound. Watch for the dolphins and fur seals and pray for rain, as you've only seen Fiordland at its most incredible when the waterfalls are in full flow. take a helicopter transfer across Mt Aspiring National Park back to Queenstown. Sit back and let the pilot show you another perspective of the World Heritage Area. Look down upon rugged peaks, sheer canyons and alpine lakes, the perfect complement to your experience on the 'finest walk in the world'.The flight option is available at an additional cost and is dependent upon the weather. 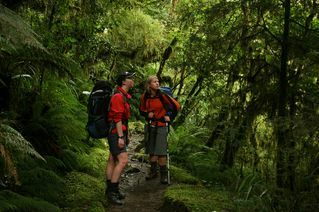 Clients who walk the Milford Track are contributing in a small but significant way to Fiordland Conservation and the Department of Conservation.